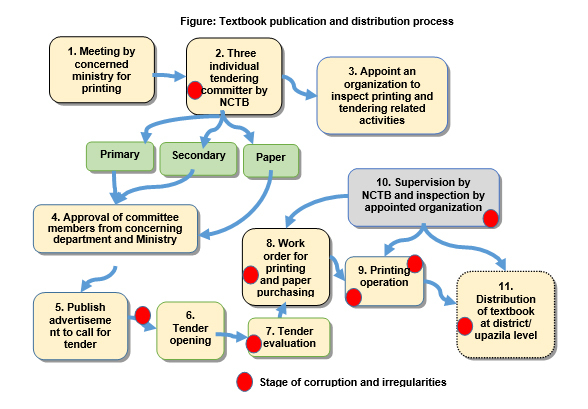 A TIB study titled ‘National Curriculum and Textbook Board (NCTB): Challenges of Good Governance and a Way-out in its Manuscript Formulation and Publication Management’ revealed that NCTB officials are not only involved in irregularities in publishing and distributing free textbooks, they also arbitrarily changed some of the textbook contents in primary and secondary levels due to political and communal pressures. 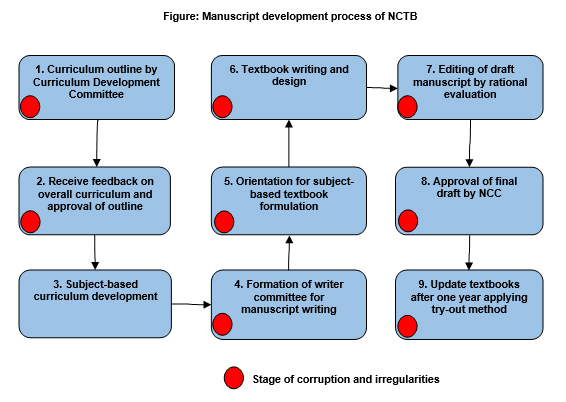 Identifying prevailing governance challenges and irregularities at various stages of manuscript formulation and publication processes, TIB proposed 16-point recommendations to ensure transparency and accountability in the operation of NCTB. Morsheda Akhter, Program Manager, Research and Policy, TIB presented the findings of the study during a press conference on 13 November 2017 at TIB’s Dhaka office. TIB Executive Director Dr. Iftekharuzzaman, Adviser for Executive Management Professor Dr. Sumaiya Khair, Director for research and policy Mohammad Rafiqul Hassan and TIB’s Senior Program Manager for research and policy Shahzada M. Akram were also present. Conducted during October 2016 to October 2017, the qualitative study collected data through key informant interviews and analysis of relevant laws and acts, various publications and reports, annual reports of concerning institutions and published articles in media. The report identified a number of governance challenges in the process of manuscript development. NCTB operation is unduly influenced and controlled by the Education Ministry though legally it is an autonomous organization. Government finalize selection of writers, curriculum development, technical and other committee members through Education Ministry with recommendations from NCTB where ruling party loyalists get preference and in some cases, members get excluded from it though they are competent. Besides, the study found that selection of participants for various orientation and workshops during subject-based manuscript development process and formation of writers’ panel occurred on personal preferences and nepotism. The study identified that a total of 16 write-ups from five textbooks at primary and secondary levels were dropped, while 11 poems removed due to demand of a communal group. TIB executive director Dr Iftekharuzzaman said that such changes by the authorities go against the spirit of the Bangladesh’s independence. If the anti-liberation forces make their way into textbooks and get institutionalised, it is a matter of grave concern for the next generation, he observed. In spite of having a rule of subject-based expert recruitment for editing textbooks of all levels, most of the times it didn’t happen. Moreover, some other observations on NCTB during manuscript development process revealed in the study include, among others: lack of coordination between writer-editor, adding or removal of topics without notifying the concerned writers, distortion of original poems, spelling mistakes and insertion of incoherent topic and photo, favouritism and lobby in the recruitment of proof-reader, exclude opinions of grass roots levels found through try-out method, absence of proper planning and system for textbook manuscript preservation etc. Irregularities and corruption also found during textbook publication and distribution process. A section of NCTB tendering committee takes illegal financial benefits by revealing the estimated quote to their preferable printing company prior to call for tenders. Terming the study findings as good governance challenge, TIB’s Executive Director Dr. Iftekharuzzman urged the government to form NCTB as an independent commission through a special committee consists of renowned national and international experts. To improve the governance in NCTB, the 16-point recommendation of TIB also includes, among others: amend NCTB ordinance 1983; specific policy for curriculum and manuscript development; regular update of curriculum; appointing experienced education and curriculum specialists as NCTB board member; formulate code of conduct for NCTB staff and employees; post qualified subject specialists in NCTB; publish all investigation report online; and introduce agreement with editor, compiler and writer including detail information about work, honorarium, deadline etc. The other recommendations are: recruit subject-based specialists and competent textbook writers for curriculum development; set a standard honorarium scale for writers; document all steps of manuscript development and publication; digital archiving of manuscripts; and introduction of e-tendering for textbook printing etc.